Why we’re sharing stories about homelessness today. Updated: June 28, 2017 Editor's Note: This post has been updated. 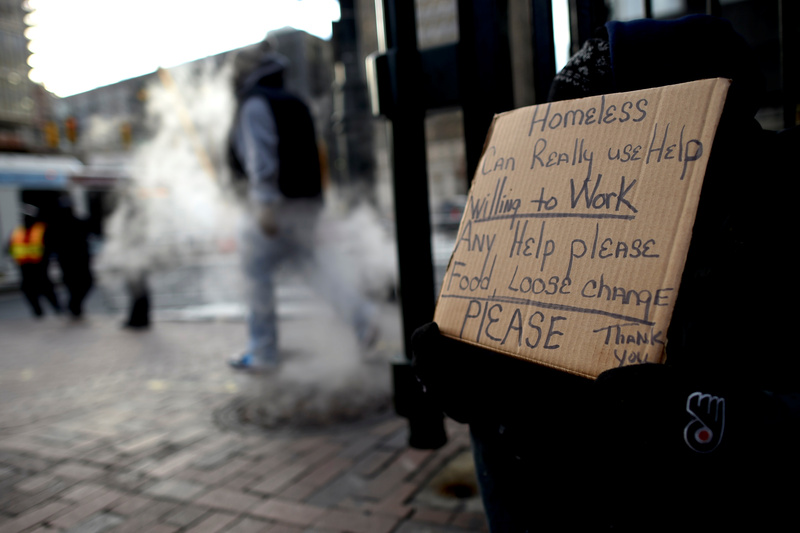 City officials in Philadelphia recently announced a “text-to-give” campaign to encourage residents to stop giving money to panhandlers. Instead of dropping change or a dollar bill into a homeless person’s cup at a stoplight or sidewalk, residents were encouraged to text a number to donate $5 to the Mayor’s Fund to End Homelessness, where their money would go toward social services, jobs, and housing programs. More funding for social services is a great idea, but some details were left unclear. Should you text-to-give right in front of the homeless individual who has just asked you for change, or wait until you’re a block away? Can you explain to him or her exactly why you’ve chosen to text financial support to the city rather than provide cash, which you fear they would spend on drugs or alcohol? That part is up to you. But the message is clear: Don’t encourage them. Philadelphia, like many other cities in Western nations that are churning up ever-greater inequality between their richest and poorest residents, appears to be seeing a spike in homelessness, fed in part by the opioid crisis and by a lack of affordable housing options. Mayor Jim Kenney’s campaign—echoing similar ones that have been launched in the past by mayors elsewhere—is rooted in a familiar frustration: Elected officials, confronted with the spectacle of destitution on the streets of a city they are determined to uplift, need to tell their voters, and themselves, that they’re doing something about it. And they need to assure their citizens that they shouldn’t feel guilty about averting their eyes, rolling up their windows, and pretending not to notice the humanitarian tragedy in their midst. Pope Francis, no stranger either to homelessness or Philadelphia, has a different take. Asked by a Milanese magazine about how best to respond to panhandlers, the pontiff was unequivocal. Giving money to the needy, he said, "is always right." It doesn’t matter what you think they’re going to spend it on: You can—you need to—give. Then [the Pope] posed a greater challenge. He said the way of giving is as important as the gift. You should not simply drop a bill into a cup and walk away. You must stop, look the person in the eyes, and touch his or her hands. Yeah, I know: Me neither. It sounds way too emotionally exhausting. But if it was easy, you probably wouldn’t need the Pope to tell you to do it. Last year, a slew of media outlets in San Francisco and Seattle gathered to produce and promote a day of blanket coverage on homelessness. CityLab, along with other national outlets, also participated in this ad-hoc media consortium, which focused heavily on the two West Coast cities known as epicenters of the problem, thanks to their booming economies and acute housing affordability crisis. Today, CityLab is renewing its participation in that project: All day, we’ll be posting stories about homelessness and the related housing affordability crisis to our homepage and sharing others on social media. We’re doing this for a few reasons. While people are living on the streets in big cities and small towns alike worldwide, in the U.S. it’s overwhelmingly an urban issue, a disease of affluence, density, and the housing pressures that result when the two combine. And it’s in cities—particularly those increasingly wealthy and unequal ones—where solutions desperately need to emerge. A common adjective in stories about the topic: intractable. That doesn’t technically mean it’s impossible to fix (I just looked it up); it’s just very, very hard. Solutions are what publications like CityLab are built to talk about, and this is a good place to start. Over the course of the year experts conservatively estimate that at least 500,000 Americans experience homelessness, nearly a quarter of them children. (Less conservative ones think it’s more like 2 million.) The project’s hashtag, #500KHomeless, speaks to that staggering figure. On most days, I must pass a dozen or more citizens of this shadow city of half a million souls, if not twice that. It’s hard to tell; like many urbanites, I’ve gotten very good at not seeing the problem. Today, I won’t have the option of looking away.